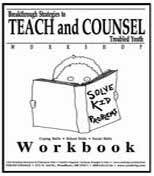 Teach and Counsel Troubled Youth set, $129 for 1 day. Scholarships: Call to get an $84 Work-Study slot: 1.800.545.5736. Bring your most serious “kid problems” with you to the next Breakthrough Strategies to Teach & Counsel Troubled Youth Workshop, and you’ll receive hundreds of practical, problem-stopping, ready-to-use K-12 behavior and classroom management interventions on the spot. This inservice workshop effectively and thoroughly delivers the best answers for your students’ worst social, emotional, behavioral, and classroom management problems. The Breakthrough Strategies to Teach & Counsel Troubled Youth Workshop equips you with 200 ready-to-use, more effective strategies to turnaround defiant, unmotivated, difficult, truant, violent, conduct disordered, oppositional, emotionally disturbed, depressed, non-compliant, learning disabled, and withdrawn youth and children ages 5 through 18. The SpeakerWiki and SpeakerMix Top 10 educational workshop zeros in on your most serious and persistent student behavior problems and then transforms you into a walking encyclopedia of the newest and best interventions that exist. The course instructor is veteran professional development speaker Ruth Herman Wells, M.S. 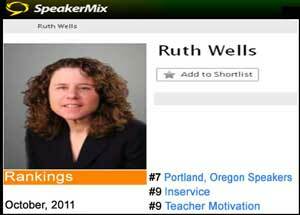 View video of speaker Ruth Herman Wells. This powerful professional development workshop floods you with innovative solutions that are more effective than conventional approaches. Counselor, juvenile justice, social work, foster care, and teacher workshops just don’t get any more practical, intense and useful than this popular event. If you teach, work, counsel, mentor, foster parent, or case manage children and youth who struggle socially, emotionally or in school, you will use every word of this powerhouse workshop. This professional development workshop won’t waste a second of your time. Every minute is filled with strategy after strategy, all designed to prevent or better manage student behavioral, emotional, social and in-school problems. In the first minutes of the workshop, you will be asked to name the specific problem areas and ages that you want to cover.. You’ll walk out the door at the end of the workshop with 200 powerful, problem-stopping answers. The course workbook (shown here) includes behavior and classroom management strategies and resources from our popular books, including our best selling Temper and Tantrum Tamers. On this page you can also see some of the reproducible, ready-to-use student behavior improvement worksheets you will find inside your course workbook. You will also receive cutting-edge, behavior and classroom management lesson plans full of activities, strategies, methods, and tools to rapidly facilitate change in even your most hard-to-reach students. Teachers, counselors, social workers, psychologists, principals and juvenile court workers have travelled from Japan, Australia, Norway and Guam to attend this one-of-a-kind professional development workshop. On evaluation forms from educational tutors, substitute teachers, child therapists, after-school workers, residential treatment staff, teaching assistants and others, we sometimes learn that the participant had forfeited a day of pay in order to be able to attend the workshop but that it was “well worth a full day’s pay.” Read attributed workshop reviews here. See Instructor Ruth Herman Wells, M.S. on video. We believe that you’ll agree that the Breakthrough Strategies to Teach & Counsel Troubled Youth Workshop is the must-have, updated information that you need to best teach, counsel, help and manage even the most challenging, distressed and problem students. L earn about all of our live, online and on-site workshops by watching a brief video. “5 hours on the freeway! I still returned the second day despite the traffic.